A unique opportunity to acquire two substantial holiday accommodation properties in this idyllic setting that enjoy views of the river and neighbouring lake beyond. The holiday accommodation is separated into two separate buildings, the brick and flint building consisting of two units of two bedroom dwellings and the weather boarded building comprising one unit with a two bedroom dwelling and three units of one bedroom dwellings. All accommodation includes off street parking and designated outdoor areas. BRICK AND FLINT BUILDING This characterful property affords two individual units. Accommodation 1: Substantial living/kitchen/dining room - divided into distinctive areas - the kitchen area with matching wall and base units under work preparation surfaces and include sink unit with single drainer and mixer tap, hob with oven beneath and extractor hood above. Spaces for fridge, freezer and washing machine. Living area - with French style doors opening to the grounds. 2 double bedrooms, one overlooking the front and the other to the rear. Bathroom - fitted with panelled bath, W.C. and wash hand basin. Accommodation 2: Sitting room with dual aspect to the front and rear. Opening to large kitchen/dining area - again designed into two distinctive areas - the kitchen area fitted with an extensive range of matching wall and base units under work preparation surfaces incorporating hob and oven, sink unit with single drainer and mixer tap. Spaces for fridge, freezer and washing machine. 2 double bedrooms. Shower room fitted with corner shower cubicle, W.C. and wash hand basin with vanity unit. This includes; Accommodation 3: An impressive dwelling with a substantial kitchen/dining/living room creating an ideal focal point. Designed into distinctive areas with French style doors opening from the living area out onto the side garden. The kitchen area is fitted with an extensive range of matching wall and base units with central preparation island and incorporating a hob with oven, extractor hood and sink unit with single drainer and mixer tap. An external rear door provides access to the rear garden. Two further doors provide access to the bedrooms. 2 double bedrooms and bathroom with Jack and Jill doors and having large spa bath, corner shower cubicle with tiled surround, W.C. with enclosed cistern and wash hand basin with vanity unit. Accommodation 4, 5 and 6: Each unit consists of kitchen/living room with matching wall and base units, hob and cooker, sink unit with single drainer and mixer tap. Space for fridge, freezer and washing machine. Opening to bedroom with external rear door to gardens. Door to en suite fitted with shower cubicle, tiled surround, W.C. and wash hand basin. Outside The holiday lets in the weather boarded building each have an individual outside space which is predominantly lawn. 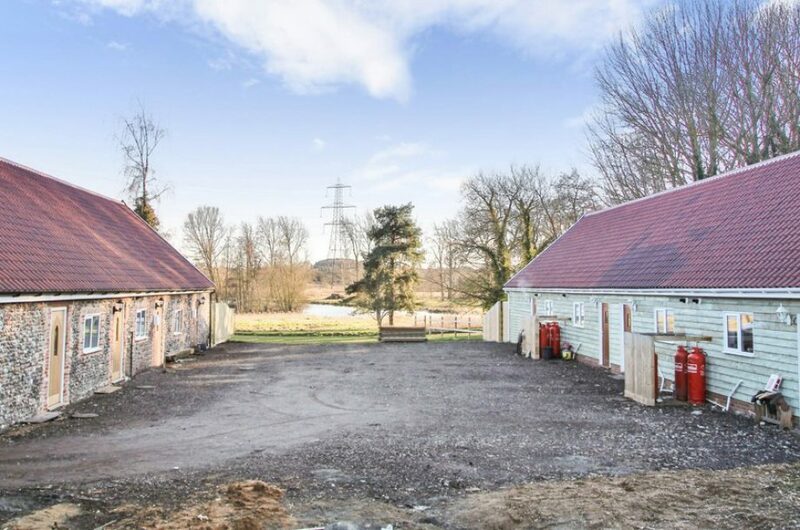 The 2 bedroom property has an extensive area with far reaching countryside views, lake and river beyond. A shared driveway leads to the communal areas where there is designed parking for each unit.